Today’s post is a first for Regency History. I have just made my very first YouTube video! 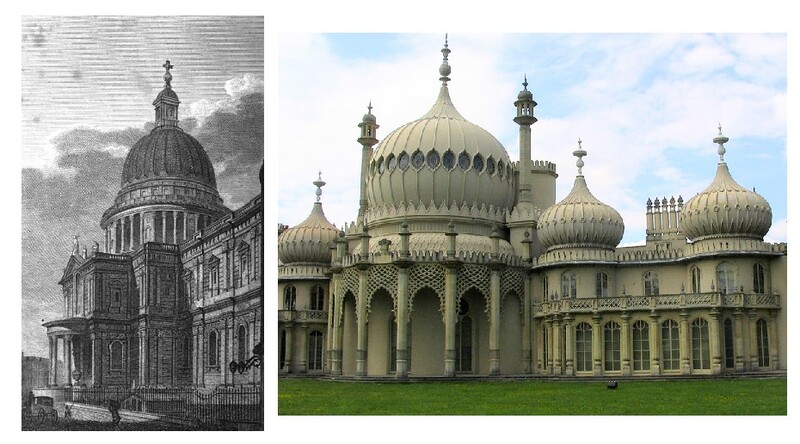 I recently gave a speech at my local Toastmasters’ group about one of my favourite Regency buildings – the Brighton Pavilion. I called it: “A litter of cupolas”. A cupola is a dome. As I am sure you know, a litter refers to the multiple offspring of an animal born at one time e.g. a litter of puppies. So a litter of cupolas is a number of little domes. A very witty description of Brighton Pavilion! My speech transports the listener back in time to experience the Pavilion in its heyday. I recorded my speech and illustrated it with pictures in PowerPoint and then converted it into a YouTube video. I hope you enjoy it. Please let me have your feedback. This is my first attempt and I am anxious to improve. Read more about George IV and Brighton Pavilion. May you do many more presentations! Thanks very much for taking the trouble to give me some feedback. I originally gave this talk in a Toastmasters' meeting. I found it interesting how much more conscious I was of every word I spoke when I was recording it! I was experimenting with word repetition for emphasis - your feedback is really helpful - thanks.